Whenever I look into the mirror prior to applying my makeup for the day, I can't help but always feel a little frustrated because of my skin. Aside from crater-size pores and unsightly blackheads, I see zits of various sizes. Mostly small with a few medium ones here and there and concentrated along my jawline. Despite having a strict and religious skin care routine, I can't stop them from appearing and can't get rid of all of them entirely either. Don't get me wrong, I have seen many cases which are much, much worse and when I reflect on them I quickly become thankful that my skin problems are mild in comparison. One of these days though I will go see my dermatologist and hope something can be done so I can get my skin looking as clear and healthy as possible. Deciding to add yet another product to my skin care routine, I bought Spot On Spot Off Daily Maintenance Acne Fading Gel from Snoe. When I first got this, it was during a time that my skin was breaking out more frequently so I hoped this could help. 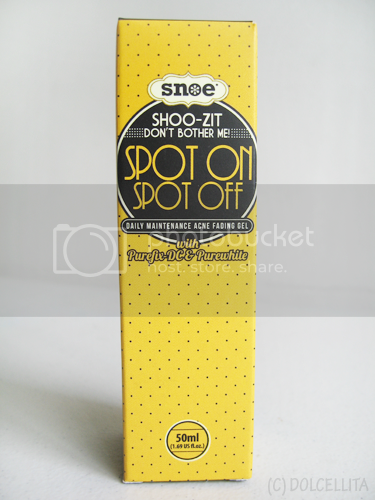 This is from their Shoo-Zit line which has a whole variety of products for treating and preventing acne. I actually have my eye on a few other things from the line too, particularly their Dip & Dry Acne Drying Lotion. The product comes in a plastic bottle that holds 50ml which actually is quite a lot for an acne treatment since they usually come in much smaller bottles or tubes. I'm really loving the almost vintage theme and color scheme going on with the design. 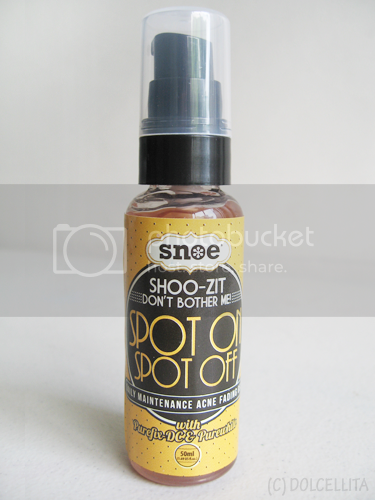 SHOOZIT's Spot On, Spot Off is an acne-fighting treatment gel that controls breakouts, unclogs pores, and restores clarity. It helps eliminate surface bacteria and gently exfoliates to control breakouts, and stimulate cell turnover. This unique formula also helps fade unwanted discoloration caused by breakouts improving skin clarity. Contains: Crown Wood Fern - a traditional herbal medicine from Korea that inhibits acne bacteria. It will stop inflammation and also acts as an anti-oxidant. PUREWHITE - a natural whitening and brightening agent. Studies show that it is more effective than arbutin in lightening spots. For convenience, the gel is dispersed via a pump which I really like because it always lets out just the right amount for me. The gel itself is clear and isn't very thick, making it easy to spread and massage into your face. 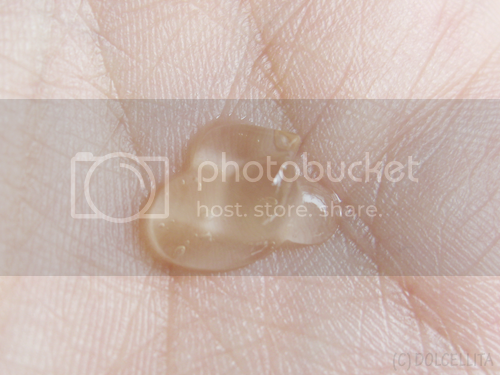 It leaves your hands a little sticky after, but it disappears quickly as it dries. I use a pump and a half for my entire face and apply it once a day at night. It definitely has an almost flowery, baby cologne scent to it, but it's mild. Directions:Every day after cleansing and toning with other SHOO-ZIT products, massage a thin layer over face and neck or spots. For optimal results, use underneath SHOOZIT's Dip and Dry or Buff the Magic Tonic at night time or during day time. Follow with recommended SNOE SPF products. I've been using this for well over a month now and I think the most visible result is that it's helped make my breakouts less frequent. It doesn't prevent or control them entirely, or even by a lot, as I still do get a zit or two popping up every now and then. On its own it does very little to take care of zits, whether they're new or old, so I still need to reach for a more specific and stronger spot treatment. Perhaps it's helped to calm down the more angry looking ones after a day or two when I do get them, but I can't really say for certain. I also haven't noticed any lightening concerning my post-acne marks. I guess it's fair to say that I'm kind of disappointed with this product but I can't be entirely since it does help to control my breakouts a little. 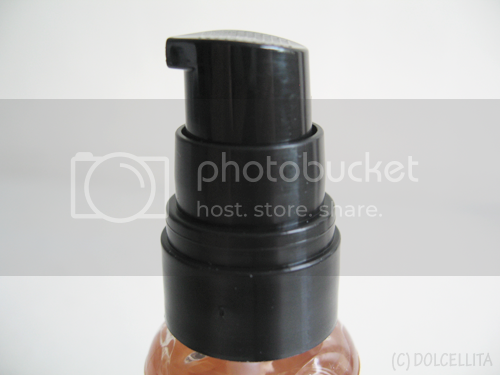 Basically I'll continue using it until I've emptied the whole bottle but I'm not sure if I'll be re-purchasing it. Helps to control and make my breakouts less frequent. Did not lighten dark spots/post-acne marks. Doesn't really help to dry out or cure existing acne. I was really hoping you had found a miracle product! :( Cute packaging doesn't take a product too far if it doesn't work! What a bummer. Bummer it didn't work out the way you had hoped. The packaging is fantastic, tho!! Looks good, but does not sound that good! Too bad you didn't get the result as expected. Maybe you should stick on one product that works on you to avoid zits and all. Seeing one really is a frustration. Thanks God they only appear on me during my period and don't stay long. Such a shame that this did not work for you. Whenever I have spots brewing I always go for Skin & Lab Vit C, this pretty much does the trick for me. I'll admit I'm a sucker for packaging, but it's a habit I have to kick because you're definitely right. Snoe really invests in their packaging, I've noticed. But the product itself was indeed kind of a bummer, sadly. @Michelle Bugante I don't think we have Duac here, which is a shame. I wish I could try it out! And yes, that's why I'm going to go see my dermatologist soon. I'm hoping she'll be able to recommend products for me. @Autumn Agreed. Especially since I heard it works pretty well for some people. @Cheryl Zamora I wish I could find just one product that'll help to treat and prevent acne, but so far, no luck. I'll have to keep searching. You're lucky yours only come then! I wish that was the case for me. @Gina Bestari I read for some people that it 'dried up' their acne, but it's either it worked differently for them or they used the wrong description that's why I assumed it would work in a similar way for me. When I wrote this review I've been using the product for a month and a half already and I saw very little healing if at all that's why I was disappointed. I guess it simply isn't 'strong' enough for me? I'm going to inquire in Lush asap to see if we have Grease Lightning here. Thanks for the recommendation! @claire s All products work differently for every person, that's definitely true. I'll be checking for the Lush product too, yes! It's so hard finding acne medicine that really works, I'm still looking. Love your blog! Sorry to hear this product didn't work for you- I myself find it difficult to find an acne product that does the job well! ermmm i love the packaging..but too bad it didn't work on you..
@Eyah You're welcome! Good thing it only happens then for you. Zits pop up for meeven when I'm just staying home! Haha. @Ileana Packaging was the best thing about this product, sadly. @Kajsa Josephine Andersen Thanks! I'm hoping to do the same too. @Natasha I'm still looking too. It feels like a never-ending process. @Amanda C. Thank you! I can only hope I stumble upon or discover my HG product for acne. im using perfect skin acne gel fr sophie paris. big zits disappears after 3 days. normal pimples in just 1 day. super hiyang for me. but right now i am also using proactiv deep cleansing wash. i think it helps to remove acne. Very useful review, it's annoying when we invest in products that are not promising & reliable as the label makes it out to be! A good zit zapper for me has always been from The Bodyshop Tea tree range. When i feel/look a bit spotty i will instantly use the foaming cleanser,mask,toner & spot treatment. That stuff really works for me & many people who i recommend it to aswell. @Arya De Guzman Not at all, Arya! Thank you :) I'll do this asap!